The Sea Launch company’s Land Launch division have followed up their return to flight of their oceanic adventures with the launch of their Zenit 3SLB, which is carrying the Intelsat-18 telecommunications satellite into orbit. Launch was on schedule at 17:00 Eastern (21:00 UTC) from the Baikonur Cosmodrome in Kazakhstan, ahead of over six hours of flight which ended with a successful spacecraft seperation. Using existing Zenit infrastructure at the Baikonur Space Center, the Land Launch system is based on a modified version of the proven Sea Launch vehicle, the three-stage Zenit-3SL. Land Launch’s Zenit-3SLB vehicle addresses the launch needs of commercial satellites weighing up to three-and-a-half metric tonnes. The two-stage Zenit-2SLB is also available for lifting payloads up to thirteen metric tonnes to inclined low Earth orbits. The Land Launch configurations are closely derived from the Sea Launch system, which returned to operations last month with the successful launch of the ATLANTIC BIRD 7 satellite. In particular, propulsion systems and all flight critical avionics are unchanged. The fairings represent the most significance difference, with the Zenit-2SLB fairing using an improved version of the heritage Zenit-2 fairing. The Zenit 3SLB and DM-SLB Upper Stage – a variant of the Block DM – launched on a mission which included three burns of the Upper Stage, resulting in spacecraft seperation six hours and 34 minutes after lift-off. The launch has been delayed several times, the latter of which resulted in a 24 hour delay from Tuesday, following unspecified issues with the spacecraft. 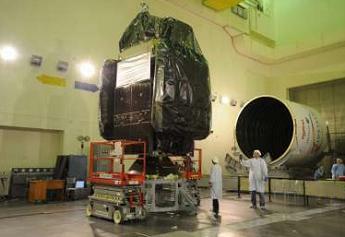 Built by Orbital Space Sciences, the Intelsat 18 satellite will weigh approximately 3,200 kilograms (7,055 lbs.) at launch and will be located at an orbital slot at 180 degrees East Longitude. The satellite’s C-band payload will serve Eastern Asia, the Western Pacific and North America. The Ku-band payload will serve North America, French Polynesia, Cook Islands, Australia, New Zealand, New Caledonia, Vanatu, Fiji, Tonga, Samoa and other islands. The satellite will provide capability to enable enhanced DTH coverage and network services capabilities via Ku-band and C-band platforms. Once operational in November, it will replace Intelsat 701 at 180E and is expected to have a useful life of nearly 17 years. The Satellite Bus is an OSC Star 2.4E, using DC Power (EOL) of 6.8 KW AE. The bird will be using Dual Mode (oxidizer, hydrazine) propulsion, with power generated by UTJ GaAs solar arrays and two battery packs with 36 total 100Ah Li-Ion cells. “Intelsat 18 will provide the infrastructure for customers to deliver media content directly to homes throughout the Pacific Ocean region, as well as broadband services directly to government and commercial users,” said Intelsat CEO David McGlade. “Intelsat’s strategy aligns our fleet investments to support our customer’s growth needs. The Intelsat 18 payload includes a Ku-band beam designed to the requirements of Office des Postes et Communications (OPT) of French Polynesia. Following closely the successful mission performed for Eutelsat – just twelve days previously from the Odyssey Launch Platform – this launch marks Sea Launch’s second mission since returning to launch operations following re-organization in late 2010. Sea Launch Company, LLC, provides contracting and management functions for the Land Launch system. Space International Services, Ltd., based in Moscow, provides hardware and services originating in Russia, Ukraine and Kazakhstan, in a subcontracting arrangement with Sea Launch.